The southern gateway to Alsace is not, as often said, the city of Thann, but the municipality Leimbach, just south of Thann. Here wine has been cultivated since the 1300s on a bedrock of limestone. Throughout the municipality there are only 23 acres of land that may be used as vineyards, but just one single hectare is cultivated for grapes. So the wine that comes from here is simply unique. And so good! 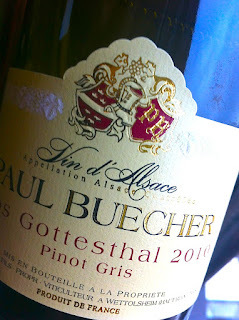 2010 Pinot Gris Gottesthal from Paul Buecher in Wettolsheim is dense and yellow-green. The fragrance contains peach, pears, orange, apricot and hazelnuts. The taste is dense, fruity but elegant with a tension and a wonderfully fresh acidity. A perfect wine for grilled vegetables and savory meats. Price: 10 €.